Browse Target Cyber Monday 2016 Sale starting on Sunday, November 27 all through December 3. 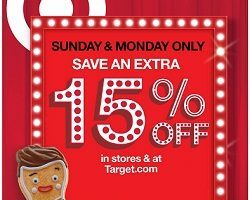 Top Target Cyber Monday deals: extra 15% off in-store and online Sunday & Monday only, 20% off select board games, 25% off sleepwear for the entire family, $24 priced appliances (see page 19), up to 40% off home items. 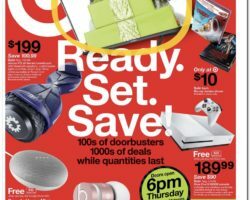 Target Black Friday Deals 2019. 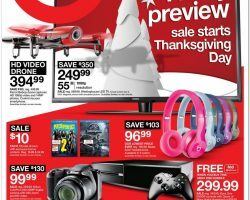 Find Target Black Friday ad, deals and sales for 2019 from blacknfriday.com. Don’t miss this year hottest Black Friday Deals & Pre Black Friday sales from Target. Target is a discount retailer in America that began operations in 1902 and has since evolved into the second largest company of this type in the country. It operates over 1,790 locations throughout the U.S. and an online shopping hub, offering easy access to a broad range of merchandise. Target stocks anything from clothing and footwear to cleaning supplies, electronics toys, beauty and personal care items, pet and party supplies, garden utensils, lawn equipment and foods among others. Target carries weekly deals and clearance prices on a regular basis. It as well helps customers save more money during Black Friday when hundreds of items are discounted and savings are included in most departments. 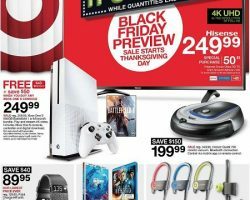 Last year, the Target Black Friday event marked steep discounts on LED televisions and other modern technology, it featured lowest prices ever on game consoles and it included special purchase top brands toys such as Melissa & Doug multi-craft, extra large weaving loom for children ages 6 and above. Sale started Thanksgiving Day and featured free shipping and returns for all online purchases.